The side effects to royal jelly, while rare, can be severe. But, potential side effects can be avoided if taken properly and with some degree of caution. My parents honey shop, where I grew up working, has sold royal jelly for years. And truthfully, we have had very few side effects reported to us when taken properly. What I mean by this is introducing it slowly into your system in very small doses AND taking no more than the recommended dose. And generally these are seen initially but go away once the dosage is cut back and you are given a chance to desensitize to the royal jelly. It should also be noted that royal jelly works to normalize body functions and can sometimes promote a 'healing crisis' type of reaction as the body works towards a healthier state. This can include (but is not limited too) headache, a general achy feeling, rashes and even loose bowels. 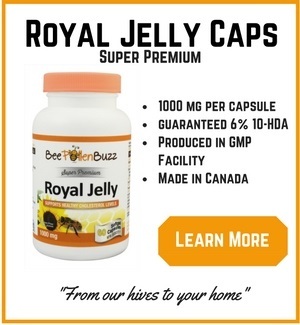 I have recommended and sold royal jelly through this site for several years and very few side effects have been communicated to me. In fact, it is so difficult to find published reports of side effects to royal jelly due to their rarity, that all I could locate when researching this topic was a report of a 26-year-old Japanese woman who developed anaphylaxis after drinking a beverage of crude royal jelly including honey. Interestingly enough, she had a history of bronchial asthma, allergic rhinitis, allergic conjunctivitis, atopic dermatitis and food allergies - she should not have been taking royal jelly in the first place. 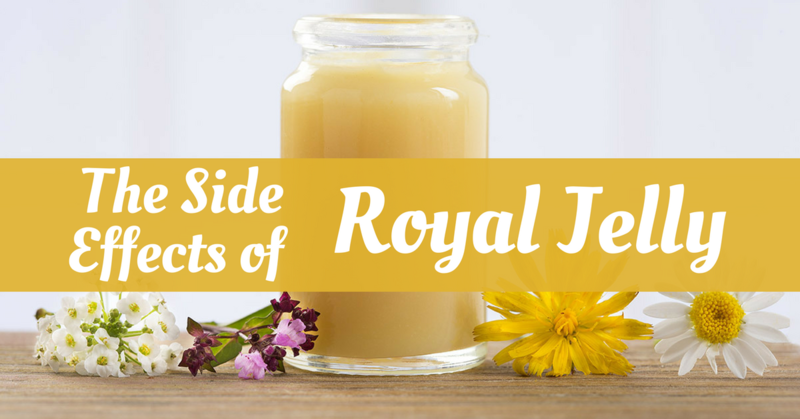 Over the millions and millions of doses of royal jelly taken since it has been commercially available, there are only 9 reports about side-effects to royal jelly related to asthma or anaphylaxis. The adverse reactions in these cases include urticaria, eczema, rhinitis and acute asthma. There is a also report of a 53 year old woman with abdominal pain and bloody diarrhea associated with royal jelly intake. You have a higher probability of experiencing a side effect to aspirin than you do to royal jelly. Here are the warnings listed on the website of one of the largest nutraceutical companies in the world about their royal jelly. This company operates in one of the most regulated and restrictive countries in the world regarding supplements. They are forced by their government to be extremely cautious in their claims and warnings. They employ many lawyers and sell boat loads of royal jelly. They have mountains of experience dealing with this product and their customers. If the side effects to royal jelly were very common and severe, you'd expect this to be communicated in their warnings? Yet they aren't...simply because side effects to royal jelly aren't very common and it is quite safe to take for the majority of people. They went on to say that Royal Jelly is suitable for use in children at one-half the adult dosage and that it is generally considered safe during pregnancy and lactation. The only caveat stated was that the effects of royal jelly during pregnancy and breastfeeding have not been sufficiently evaluated so it should not be used during these times unless directed by a health care professional. My point is this - royal jelly is quite safe for most of us, so much so that children can take it and pregnant women can likely take it as well. But I can't say it enough - start out with very small amounts and work up to the recommended dose slowly to minimize the risk of a reaction. As with many supplements, taking too much royal jelly too soon can lead to side effects such as what Samia S. reported to us. 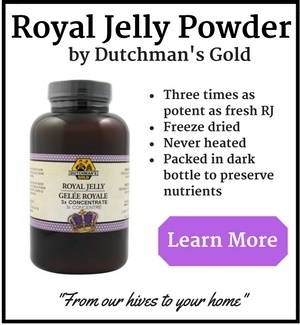 "I have been taking royal jelly for a short time, maybe a month. Not every day but off and on. Tonite I took some....and I do believe I took too much. I felt so weird and just yucky. What I mean is....my throat felt scratchy and I was coughing....and felt light headed almost to the point I wanted to faint. Even rapid heart beat. I will definitely slow down and watch my dose. Very scary feeling. I started taking royal jelly because I heard it was good to aide in fertility. I am trying to conceive my second child. I wanted to share this info." When taken properly, royal jelly is very safe. But you must treat it with respect and assume you have an allergy to it before starting. What I mean by this is start with a very small amount and increase from there if you tolerate it well. I often suggest 1/8 or less of the recommended dose to start or even less for the ultra-cautious. 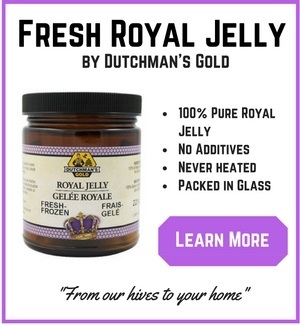 I recommend you read the comments posted below by people who have experienced side effects to Royal Jelly. Most of the side effects involve nausea and or vomiting. I am quite sure none of these users started out with 1/8 of the recommended dose and gradually increased their dose. Instead, a full capsule or dose was taken the very first time and a nasty side effect was realized. I urge you when researching online to gather your royal jelly information from reputable sources who have ample amounts of hands on experience dealing with bee products. There are simply too many 'fly by night' web sites out there posing as experts and making claims that they can not substantiate.